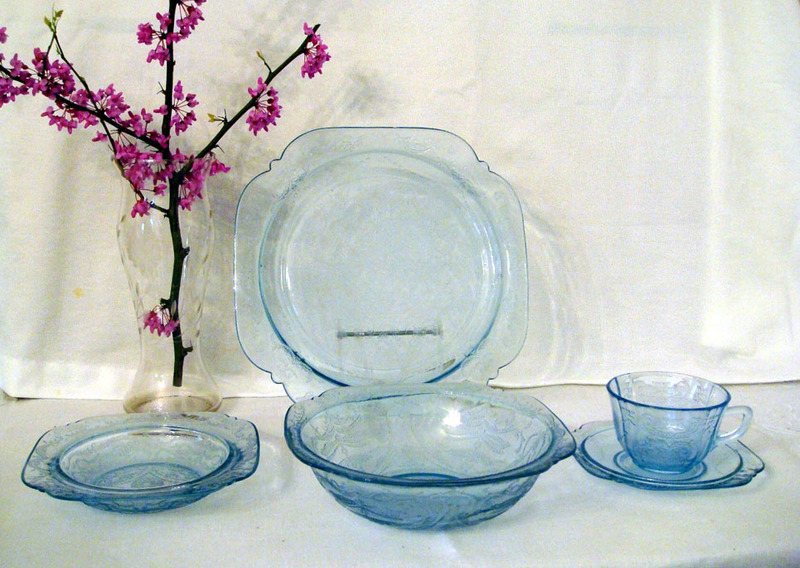 Made from 1932-1939 in green, amber, pink, crystal and blue, Madrid pattern molds were adapted from Federal's "Parrot" pattern. Only the original "Springtime Green" and "Golden Glow" were made in great quantity with amber becoming the most popular color. Other colors remained in this mold-etched design for only a short time and are much more difficult to collect today. While there were a wide variety of pieces made in both green and amber, the line was much smaller in other colors. 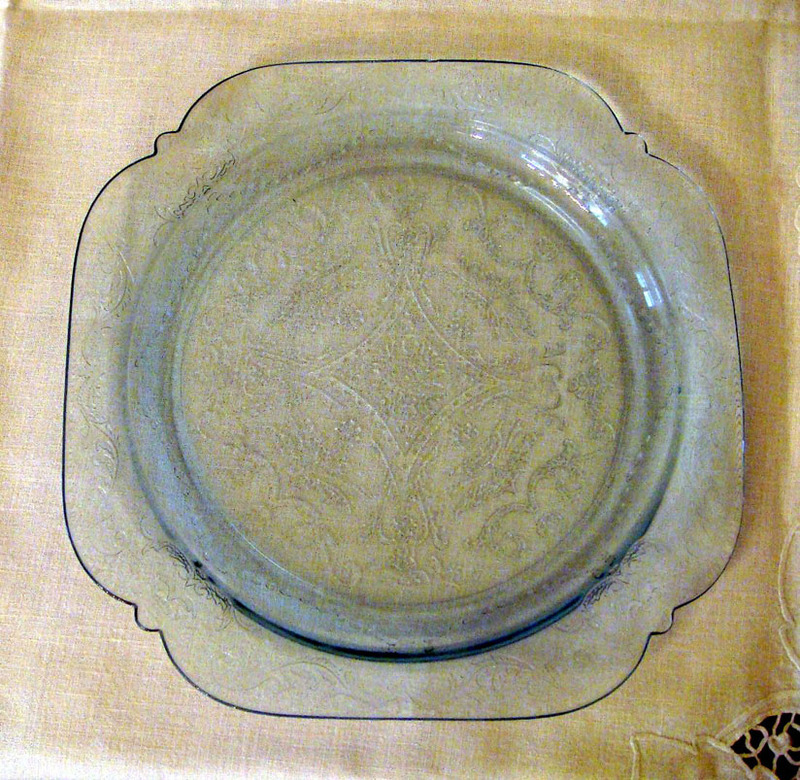 Reproduction and new pieces made by Indiana have discouraged some from collecting this pattern. However, with research and careful study the difference between old and "new" are easily discernible both by color and some design variations. In 1974 my mother gave me her collection of "Madonna" blue Madrid that consisted of about 30 pieces, which had belonged to an aunt of hers. 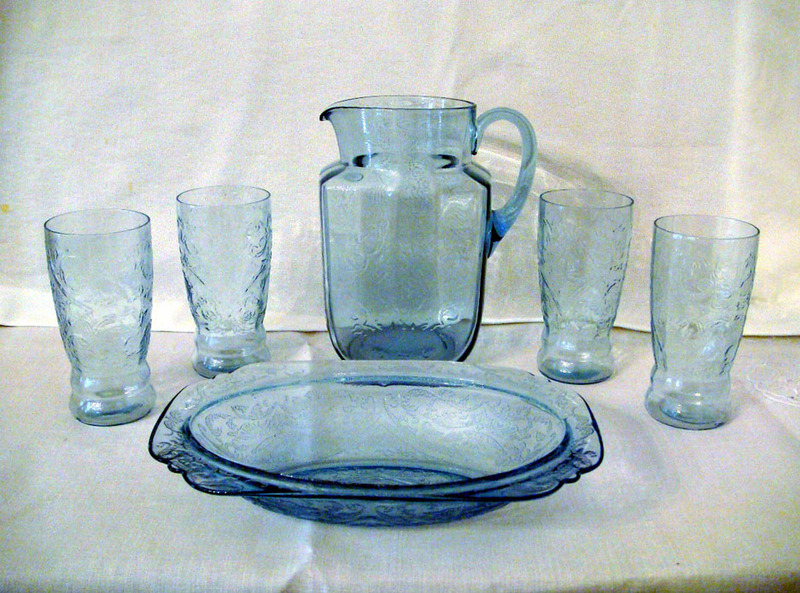 Aunt Lily had accumulated these lovely "dishes" as premiums offered by the "Jewel Tea Man" who visited her rural Texas community periodically during the early 1930s. 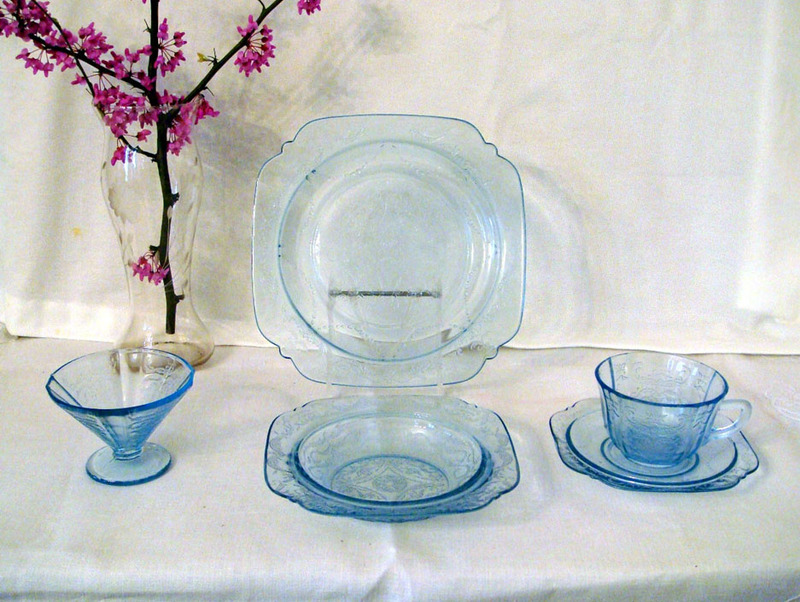 This gift became the launching point for my interest in and collecting of depression era glass. 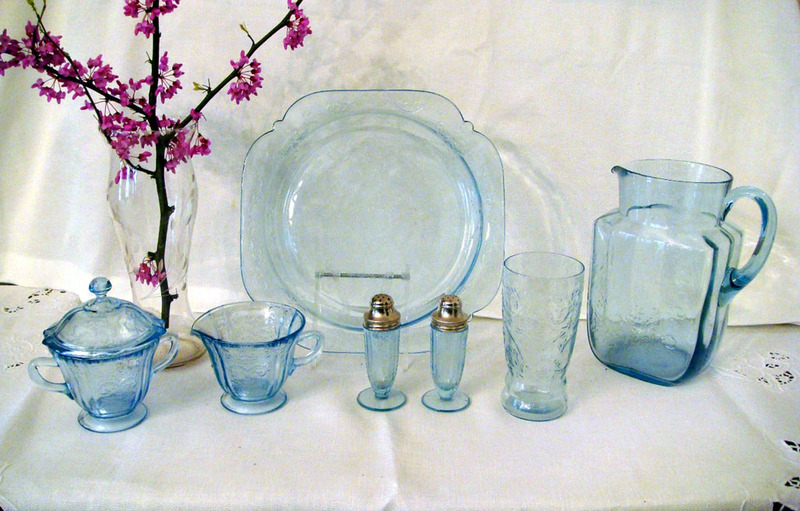 I attended my first glass show in 1975 specifically to identify and learn more about this beautiful blue glassware. Over the next ten years I was able to find many additions to the original number I had received. 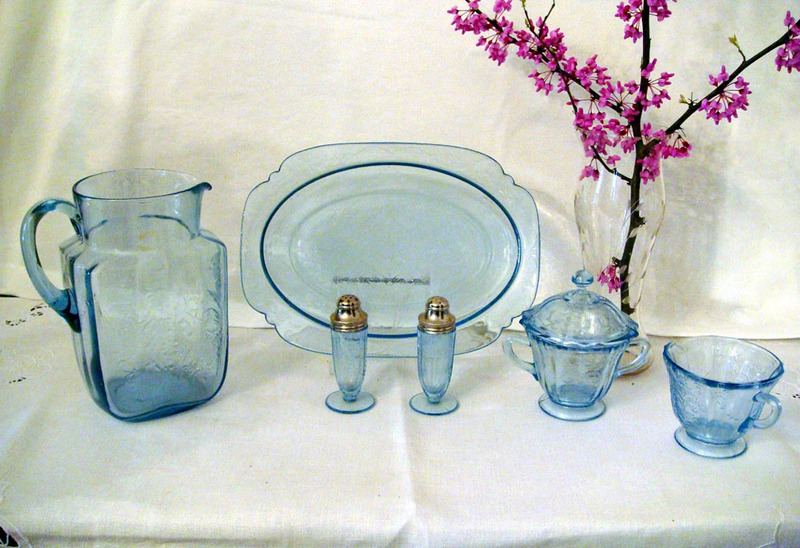 Some of the harder to find pieces in blue are the sugar lid, footed shakers and 8" square pitcher. Thirty-five years and hundreds of purchases later I continue to enjoy my many glass collections. I never tire of learning about this colorful period in our American glass manufacturing history and remain thankful for the many friends my husband, John, and I have made in this "world of collectors." I am grateful to my mother for teaching me to appreciate beauty found both in God's creation and through the talent of mankind. I am reminded of each as spring arrives along with her April birthday.